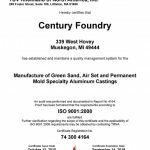 Green Sand – Century Foundry Inc.
Century Foundry uses the greensand process to efficiently and inexpensively produce larger volumes of aluminum castings. The manual operations are anchored by three Roto Lift lines that produce aluminum castings ranging from small to very large. We have all flask sizes available, below is a breakdown of what each line can handle. Century can also produce larger volumes of aluminum castings with the Sinto FBO 3 automatic molding machine. 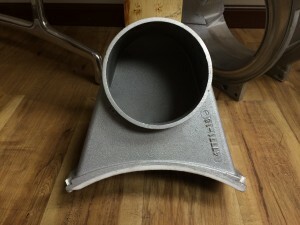 This process can provide aluminum castings from ½ lb. to 60 lbs. in a 20” x 24” flask. With our highly experienced production team coordinating with our customer’s design team, Century can prepare customer designs for production and market with agility and speed. Our typical lead times are competitive. Century Foundry is very proud to be a fully ISO 9001:2015 certified facility. 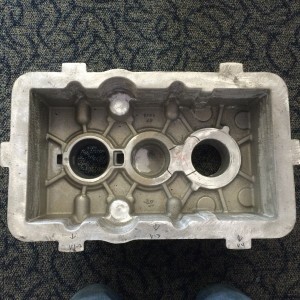 Our Quality Management System is in full conformance with the International Quality Systems Standard as a manufacturer of green sand, airset and permanent mold specialty aluminum castings. All castings and processes have written procedures to ensure parts meet customer expectations. Copyright © 2015 by Century Foundry, Inc. All rights reserved.